The Nathan Yip Foundation was built on the legacy of Nathan Yip, a young man who had a passion for philanthropy. He looked at the world through a lens of empathy and knew, even from a young age, that he would make a difference. Nathan was a member of the Future Givers club in high school, which organized young people to harness their energy to volunteer and raise funds for causes near and dear to their hearts. Now we are empowering youth to give back to the very communities we serve by fostering this same spirit of philanthropy. We recognize that the youth involved with the Nathan Yip Foundation have a wide variety of talents and skills, and we’re proud of the way these young people have focused their strengths in order to give back to other schools, students, and communities in need. If you are a student and have a fundraising project you’re working on, we would love to hear your ideas for partnership! Eric is a freshman at Bryant University. Two years ago, together with his younger brother, Jason, they founded Green Island Life, a philanthropy venture that donates all sales proceeds to non-profit organizations. Started as a hobby project, Eric and Jason made natural lip balm, shampoo & conditioner, lotion, and body cream. Unlike most kids, the brothers did not use the profit to purchase anything for themselves. Instead they donated all sale proceeds to support local non-profits. This year, the Nathan Yip Foundation is the proud recipient of their entrepreneurial efforts! “We grew up heavily involved in the Chinese American community, so we wanted to help contribute to educational needs in China and Colorado. That is why we are partnering with the Nathan Yip Foundation!” – Eric Zhang. Green Island Life will also be setting up a sales booth at the upcoming Nathan Yip Foundation Dim Sum Lunch on Saturday, September 22nd. Proceeds from each event will benefit the Nathan Yip Foundation’s current and upcoming educational projects. Kelly Franson is student at D’Evelyn High School (Class of 2018) where she is President of the National Honor Society, a mock trial attorney, and Teen Court volunteer. In her free time, Kelly is an avid stock investor, piano teacher and performer, and long-time volunteer for the Nathan Yip Foundation’s various events. In the fall of 2017, Kelly used her talents as a gifted pianist and held a piano recital, where she asked that friends and family donate their entry fee to the Nathan Yip Foundation. Not only was it a beautiful celebration of music and community, but through this one event, Kelly raised close to $900 for the Nathan Yip Foundation. Luke Stratton is a student at George Washington High School (Class of 2021), where he runs cross-country and competes in speech and debate. Luke believes in helping others less fortunate than him and gives annually to Volunteers of America to buy Christmas gifts for children. In the summer of 2016, Luke raised over $200 for the Nathan Yip Foundation by taking on small jobs, like lawn mowing, around his neighborhood. In 2017, for his birthday, Luke asked that, in lieu of gifts, his friends and family make a donation to the Nathan Yip Foundation. 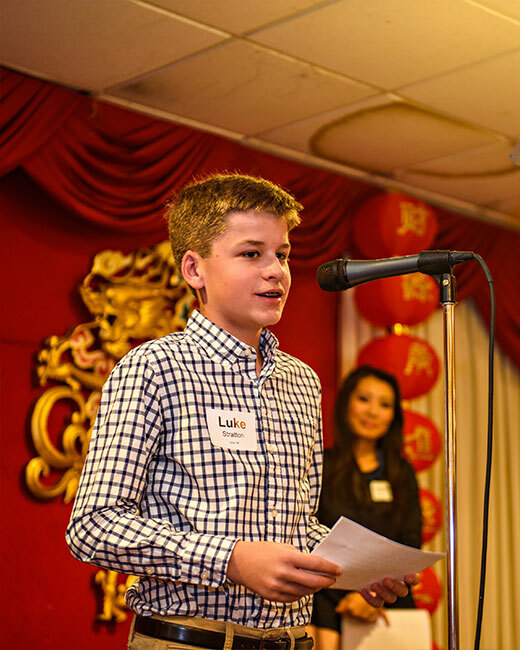 Luke continues to donate his time to the Nathan Yip Foundation, volunteering most recently at our Chinese New Year celebration. He is a true model of selflessness and using his strengths to make a difference in the community.